Someone who is addicted to the use of ether as a drug. 1. An obsessive devotion to one's own ethnic people or race. 2. Fanatical nationalism of a people or race. An unreasonable or immoderate nationalist. An obsessive or uncontrollable desire to smoke a tobacco product (cigarettes, cigars, or pipe, etc.) which are often an addiction. The terms, capnomania, fumimania are all coined terms that mean "obsessive or uncontrollable desires or habits of smoking one or more tobacco products" (especially cigarettes, but they may include cigars, pipes, etc.) all of which also can be defined as "tobacco addictions". They were coined by John G. Robertson in 2002 for his book: An Excess of Phobias and Manias, published in 2003, because they were unavailable in any dictionaries or other known sources to express these conditions. The terms capno- comes from Greek and fumi- comes from Latin; both of which refer to various kinds of "smoke" or "fumes". See the pages at this Capnomania-Fumimania, Part 1 for the poem, "The Ballad of Salvation Bill" and other pages about the problems of smoking from the past to the present. You may see similar words (capnomania, capnomaniac, capnophobia, capnophobiac) which were also created by John Robertson at this capno- unit of words. Anyone who has an obsession, or uncontrollable habit of smoking a tobacco product (cigarettes, cigars, or tobacco in pipes, etc.). 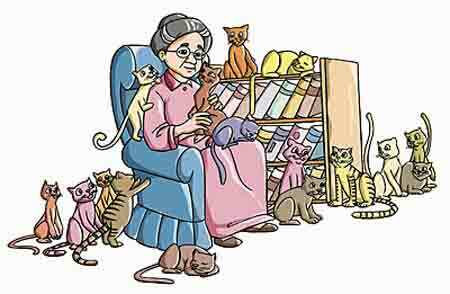 An abnormal desire to have many cats around: There are frequently stories in the newspaper of people suffering from galeomania because they are trying to have too many cats for their small living areas. In order to maintain a well-balanced perspective, people who have a dog to worship them should also have a cat to ignore them. 1. In psychiatry, a morbid desire to marry. 2. An urge to make outrageous or extravagant proposals of marriage. Showing page 10 out of 27 pages of 403 main-word entries or main-word-entry groups.